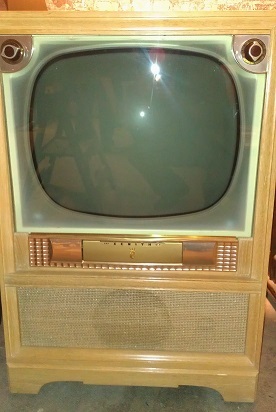 I was out for an adventure a few years ago and stumbled across a Zenith TV Model R2671E with a Model R Chassis. I knew that the picture didn't work, but the audio did so I thought that this might be a relatively easier fix than a tv with no sound or picture. I've done quite a bit of restoration of Grundig radios, by the way. 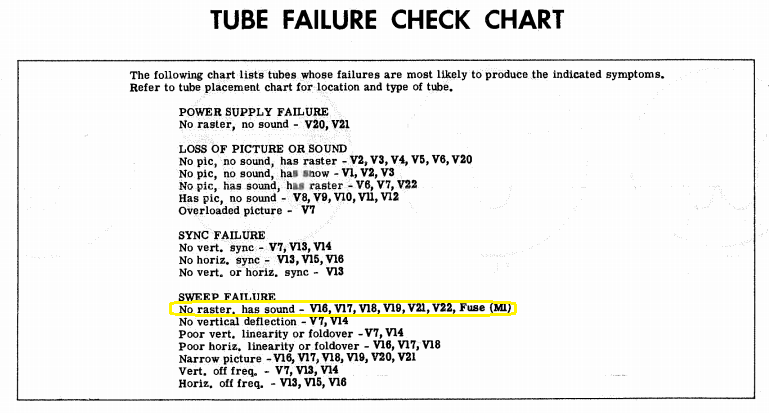 I have the schematic and identified the tube failure chart that suggests which tubes to look at. Welcome to the forum. I'm rather fond of Zenith products. You will have to include more info on the problem. Did you already turn the set on? Is the screen completely dark? Is the set making any sound other from the speaker (like a very high pitched whistle)? It may not be a tube. With a set this old you shouldn't turn it one until some parts like the large capacitors are replaced. 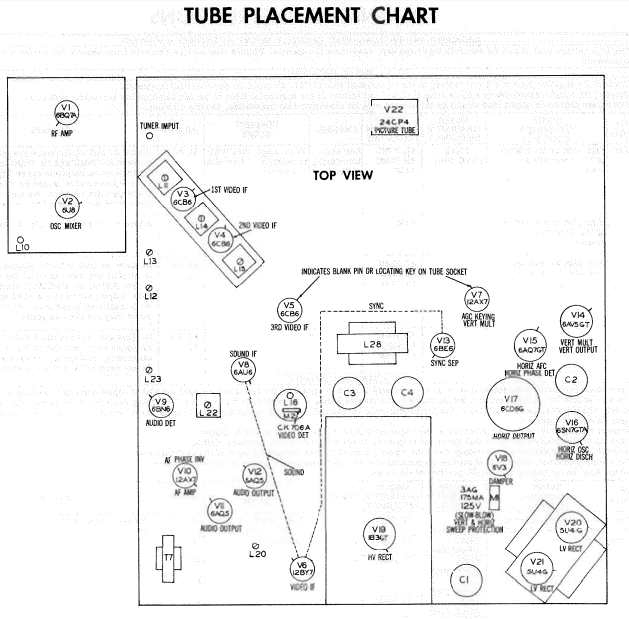 Do you have access to a picture tube tester? How about a regular (radio) tube tester? Those are things you could look at before turning the set on. 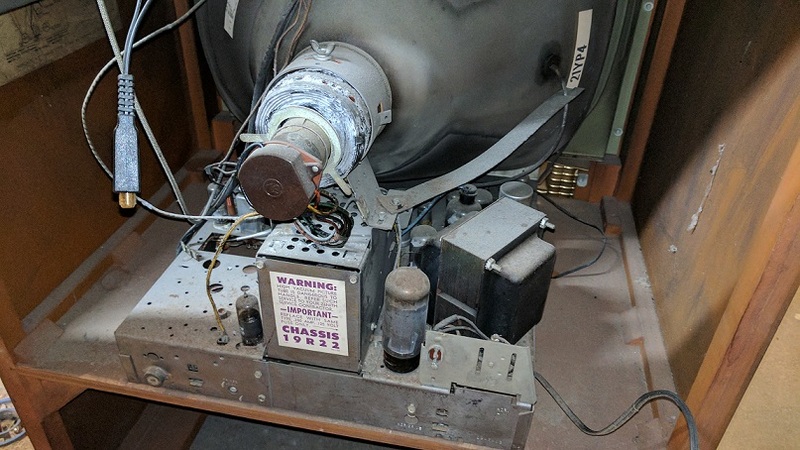 If the CRT is a dud restoring may not be worth it for you. Pictures of the set are always welcome. Thanks for the fast reply. I tried to post schematics last night, but being a new account, I was forbidden from doing so. Perhaps now that I'm approved, I will be able to do so. I did turn the set on. Screen is completely dark. No other sounds from the set besides the audio fuzz. I don't have a picture tube tester. I do have a regular radio tube tester. OK. Thanks for the pictures. I'm assuming that you are new to this. If you have a tube tester it wouldn't hurt to test what you can. Don't bother testing the HV Rectifier, V19, 1B3GT at this time. Most tube testers aren't a good judge of these. There are some fuses you can check. More than anything they can indicate where a problem is if blown. Since you have already have turned it on, check to see if the picture tube filament glows. There are some expensive and hard to find things in this set that can be damaged like the big power transformer and the flyback by too much current. If you find a blown fuse don't replace it until you find the problem. So, things can get complicated from here. Do you want to spend time and money on it not knowing whether the picture tube is good? I would take the gamble, you may not. The CRT is probably OK, but it might not be. With out researching it, off hand I don't know how hard it would be to find a replacement, someone on the forum might have one. You might have to pay in the neighborhood of $100 for one. The first successful color tube from the same year as your set goes for around $1000 now. The cost of the capacitors isn't very much, but it takes a while to replace them right. If you don't want to restore it, someone will take it off your hands. Also many times people are looking for replacement parts. Please don't put it in a dumpster! One more thing. If your set is from 1955, I think the model number should be T2671E. T is year 1955.
wow great shape good luck with it. Nice lookin set. Even if the CRT is bad I would find one. Not valuable but the condition is A-1 . on a plastic rod abt 8" long. It will light if near the HV. Do not run for more than a minute until you get back a raster. Thanks to everyone for the support, ideas and kind words. 1. Worst case, I definitely won't toss it and will try to find someone that can use it for parts. 2. I won't touch the recap until I can get some light to the CRT. 3. I have successfully unplugged and cleaned the chassis. Lots different than a stereo, but also a lot of familiarity in there. 4. I bought a few replacement tubes for some of the main culprits and they arrive tomorrow night. I'll let you all know once I try those NOS tubes. 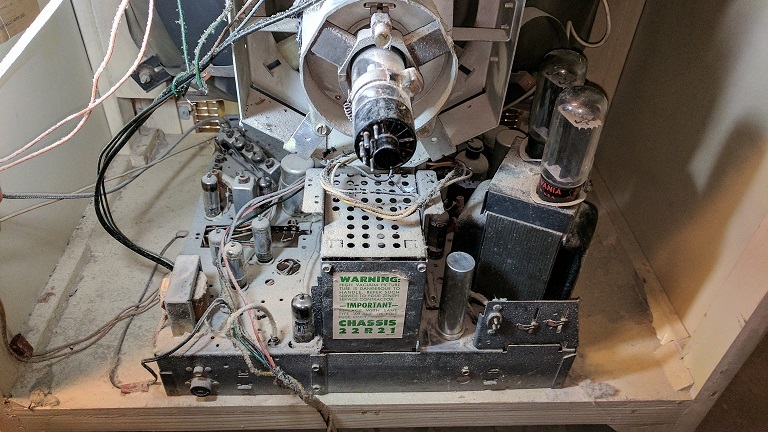 Here is a link to an article about restoring a Zenith from the same year. Phil has a great website and is a member of this forum. I agree with just about everything he does. There could be many reasons for a blank screen. Just one loose wire could do it. The set is 60 years old, I doubt that the electrolytic capacitors are any good. I wouldn't doubt that one or both the 5U4 tubes might be damaged from the high current drawn by bad caps. All the supply voltage except the filaments probably goes through them. You might put together a Dim Bulb power limiter. I think Phil's website tells about it. I think that I've identified that the damper tube is bad. Spent some time with my tube tester and given some of the feedback a few days ago, this makes sense. I also went and ordered a few other tubes that could be the culprit, but that also seemed to be on the edge of good/bad. Should have them mid-week. and for the 2.7kOhm resistor in series, I assume that it means the positive terminal side of the electrolytic. 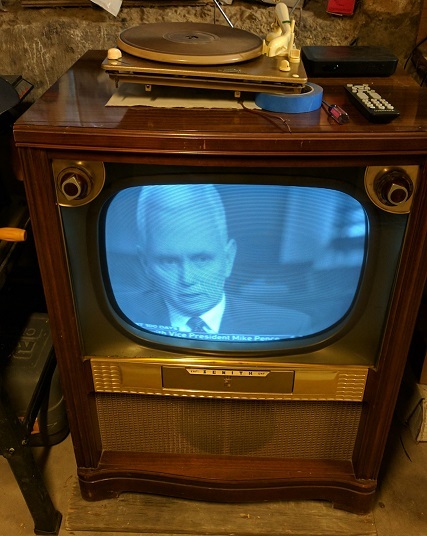 I went back through the whole thread; maybe I missed something, but is there a reason the CRT is disconnected? Hi Fixitland. That picture was me after I took the back off and started unhooking things, but then remembering to snap a photo before I did too much. I reconnected the CRT after my most recent tests and it still doesn't work. I can see how you could get confused by these footnotes. But the symbols in the capacitor list do not refer to the other set. There are markings on the bottom of the capacitors in the metal cans. There are several sections in these cans and the symbols refer to the different sections. If you had to replace some of those coils with other than Zenith parts, then you would have to do the modifications mentioned in the notes below the coils list. Lets hope that you never have to do that. So C1, C2, C3 and C4 are multi-section electrolytics. Which you will replace with multiple separate capacitors. If there is enough room you can just disconnect the wires from the cans and mount the new caps nearby under the chassis. If you do that you should use cable tie wraps or similar to hold the caps because they are relatively heavy. If you check the re-capping article on the Phil's Old Radio site it will explain some of this. Re-stuffing the old cans with the new caps is more involved but can be done. I guess I better add a few more things since you probably will be ordering the caps soon (if you haven't already). Most of the time I order caps and resistors from places like Mouser and Digikey. Most of the paper caps I replace with what have been called brown 'Chiclet' caps by Panasonic, Xicon or Nichicon. Be sure you get the ones with the long leads, some have short leads meant for printed circuit boards. When you order the electrolytics, if you have a choice get the 105 degree C, rather the 85 degree. As Notimetolooze noted, there are various ways to deal with multi-section electrolytics in cans. I received my tube order in the mail last night, including the 6V3 Damper tube. I have tested all the tubes, with the exception of the HV rectifier based upon the recommendation above, and still don't have any raster on the CRT. When I tested the new 6V3 that arrived in the mail, surprisingly, it didn't perform well on the tube tester. In fact, it showed as "Bad", almost too close to how my original one showed. So my question is will a 6V3 tube be possible to accurately test on a tube tester or is it like the 1BG3T HV Rectifier and not show an accurate reading? I've already ordered another 6V3 since they are so cheap, but starting to get concerned that the CRT may be bad. On the crazy chance that this could work, can I plug the cable that feeds the good CRT from the good chassis to the unknown CRT to see if the CRT is good or not? I don't know where in the schematics I can find the output voltages and such, but thought that I would raise the question here. I have not recapped the working tv yet, FYI. Was going to test my skills on the non-working one first. On the crazy chance that this could work, can I plug the cable that feeds the good CRT from the good chassis to the unknown CRT to see if the CRT is good or not? You don't want to do that, what will happen is without deflection the CRT will light up with a dot in the center which could quickly burn a spot in the phosphor. If you have sound but no picture then you probably have no high voltage, if that's the case it's usually caused by the horizontal oscillator not running. If the oscillator isn't running the output tube will usually get very hot very quickly, sometimes even turning the plate red. Pull the cap up on the output tube just enough to slip a screwdriver blade in, with the set running you should be able to draw a small steady arc from the cap of the tube to an ungrounded screwdriver tip. make sure the screwdriver has a well insulated handle.